It really is okay to refer to children as kids. According to Etymology Online, the slang use of kid to mean “human child” was first recorded in the 1590s, and it was established in informal usage by the 1840s. There’s no sense arguing that kid “means” a young goat. It has also commonly meant “a human child” for at least 170 years, and this practice has been widespread across the U.S. for decades. If this isn’t an example of a word whose meaning has broadened by time and popular usage, I don’t know what is. 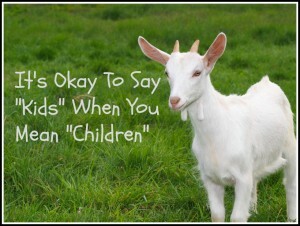 Child or children is still preferred in formal contexts, but every dictionary includes the “child” definition and certainly no one would confuse your reference with a baby goat. If you are in the habit of correcting people who refer to children as kids, please stop. Silly goat. Your comments are welcome. Please leave them in the Reply section below. Why Is It Always Bad To Have an Attitude? Does Repeating a Grammar Error Often Enough Make It Right? Wow, I didn’t know it has been around that long. Thank you for the fascinating information. Leave a Reply to Brian Wasko Click here to cancel reply.